While he had served with distinction in the Civil War and Indian Wars, Henry W. Lawton rose to national prominence for his service in the Spanish-American War and Philippine Insurrection. Lawton was a gallant and dashing leader who always led from the front. While his style of leadership served as an inspiration for the troops under him, his indifference to the dangers of combat eventually led to his death in a battle in the Philippines in 1899. Henry Ware Lawton was born near Toledo, Ohio, on 17 March 1843 and raised in Indiana. He attended Fort Wayne Episcopal College but left before graduating in 1861 to enlist in the 9th Indiana Volunteers. He saw action in western Virginia in the early campaigns of the Civil War before mustering out. Three weeks later, he joined the 30th Indiana Volunteers as a first lieutenant. Lawton’s regiment participated in heavy fighting at the battles of Shiloh, Stone’s River, and Chickamauga. During the Atlanta campaign, Lawton was promoted to captain. On 3 August 1864, Lawton led an assault on a key enemy position and held it against determined enemy counterattacks. For his actions on 3 August, Lawton was awarded the Medal of Honor. He was later promoted to lieutenant colonel and fought at the battles of Franklin and Nashville in late 1864. He was brevetted a colonel shortly before the war ended. After mustering out of the Army, Lawton briefly attended Harvard Law School before rejoining the Army. He was appointed a second lieutenant in the 41st Infantry, a regiment of of black troops, on 28 July 1866. He was promoted to first lieutenant the following year and served in several campaigns of the Indian Wars. In 1869, the 41st was merged with the 39th Infantry and redesign Ted the 24th Infantry. He was later reassigned to the 4th Cavalry in 1871. On 20 May 1879, Lawton was promoted to captain and appointed commander of B Troop, 4th Cavalry. In 1886, while stationed at Fort Huachuca in what is now Arizona, Lawton received orders from MG Nelson Miles to lead an expedition of infantry, cavalry, and Indian scouts to capture the Apache chief Geronimo and his followers. After a pursuit of some 1,300 miles through the mountains of Mexico and Arizona, Geronimo finally surrendered, effectively bringing an end to the Indian Wars in the southwestern U.S. In recognition of his accomplishments, Lawton was promoted to major and made inspector general of the Army. He was later promoted to lieutenant colonel on 18 February 1898 and colonel in the Regular Army on 7 July 1898. 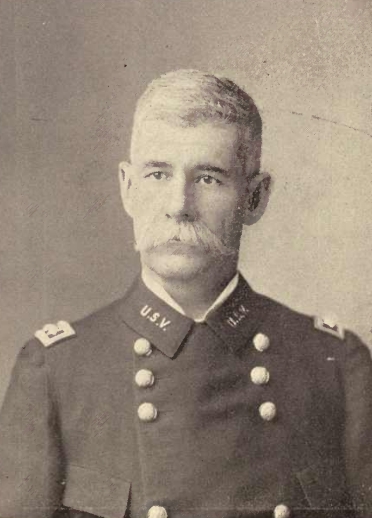 With the outbreak of war with Spain in April 1898, Lawton was anxious to get out of Washington and serve in the war. MG William Shafter, commander of the U.S. invasion of Cuba, originally wanted Lawton as his chief of staff. High-ranking personnel within the Army, however, lobbied to get Lawton a command position. He was promoted to brigadier general of volunteers and given command of the 2d Division, V Corps. Lawton led his division ashore at Daiquiri on 22 June 1898 and pushed inland. When MG Joseph Wheeler’s division ran into heavy Spanish resistance at Las Guisimas, Lawton was called upon to reinforce Wheeler. Just as Lawton’s troops arrived on the scene, the Spanish began to retreat. Later, when Wheeler fell ill, Lawton was ordered to take El Caney, a key position in the defenses of Santiago. On 1 July, Lawton’s division, spearheaded by the 12th Infantry, captured El Caney after heavy fighting. Lawton assisted in negotiating the Spanish surrender and was later named the military governor of Santiago. His service in Cuba made him a favorite of the press and his superiors in Washington. Lawton, now a major general, longed to return to a command position instead of being an administrator. After briefly commanding IV Corps in Alabama, he was reassigned to the Philippines, where hostilities had broken out between U.S. troops and Filipino rebels. Upon his arrival in Manila in March 1899, Lawton assumed command of U.S. Regular Army forces in the Philippines. In April 1899, Lawton captured the rebel stronghold of Santa Cruz. In addition, he captured the rebel villages of San Rafael and San Isidro the following month. In battle, Lawton was a fearless leader and greatly respected by his men. It was his leadership style, however, that led to his death. At San Mateo on 15 December 1899, Lawton was once again leading from the front, refusing to take cover from enemy rifle fire despite pleas from his staff. Already a conspicuous target because of his size (well over six feet tall), Lawton’s yellow raincoat and white helmet made him even more of a target. Suddenly, a bullet from an enemy sharpshooter struck Lawton in the chest. Lawton yelled, “I am shot,” and fell dead into the arms of a staff officer. Lawton was deeply mourned by the Army and the American people. His casket was displayed in his native Indiana before his burial in Arlington National Cemetery.